The best to understand in Pai gow to win a game is the knowledge of three basic elements and their combination according to player’s choice. In Pai Gow Tile game the key element is to present the optimal front hand and rear hand given four tiles dealt to the player. There are three ways to arrange four tiles into two hands, though practically some combinations may be the same. With an example let us consider the four tiles. If tile A were made into a hand with tile B both resulting hands would score zero. However if tile A were paired with tile C, both hands would score 5. Or if tile A were paired with tile D, the front hand would score 3 and the rear hand would score 7. The player must decide which front hand-back hand combination is most likely to beat both of the dealers’ hands, or at least to break a tie in the player’s favour. In some cases a player with weaker tiles may deliberately attempt to attain a push so as to avoid losing the bet outright. Many players rely on superstition or tradition to choose tile pairings. General rules for setting any seven card hand also called the optimal strategy. The way the casino instructs its dealers to set their hands known as the house way strategy. Betting on your hand, regardless of how you set it called the bonus bet strategy. 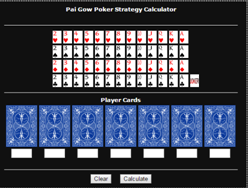 Optimal Pai Gow strategy is the strategy that works as basic strategy for most hands. The secret to winning Pai Gow poker is in remembering that you have to win both hands in order to win the bet. 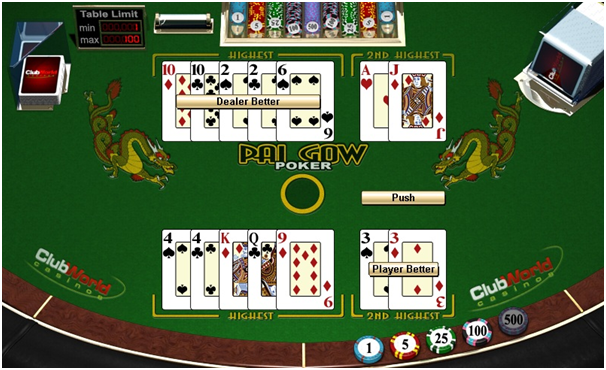 The player’s basic strategy in Pai Gow poker is therefore to set the two-card hand (front) as high as possible, whilst still leaving a higher five-card hand (back). If this isn’t possible, and would leave you with two weak hands, set a ‘stopper’ or ‘blocker’ by setting the back hand as high as possible and leave a weak front hand. This won’t win, but will hopefully stop the bank winning, giving you a chance to bet again. If your hand is just single cards (ie nothing – no pairs, straights, flushes) all you can do is set your 2nd and 3rd highest cards as the front. If you have a single pair, put the highest two single cards as your two-card hand eg if your hand is K,10,10,9,5,3,2, split them into K,9 and 10,10,5,3,2. This strategy will cover the majority of hands you’ll be dealt and is a good way to start with the basics of the game. If there are two pair always split, unless two pairs of 6s or below and if the hand contains an ace. Then better to play the ace behind. In case of three pair always play the highest pair in front. If three Aces, play a pair of Aces behind and Ace high in front. Otherwise, play the three of a kind behind and the remaining high cards in front. For Straight / Flush / Straight flush set the back as whichever hand gives the better front. In case of full House set the three of a kind behind and the pair in front. If there are two sets of three-of-a-kind split the higher set into a pair and a single – play the pair in front and play the smaller 3-of-a-kind behind. For example, withK,K,K,10,10,10,5 you should play K,K and 10,10,10,K,5.. 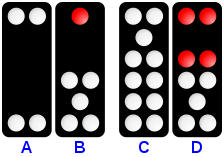 In case of four of a kind; If 2 to 6, play it behind; If 7 to 10, split into pairs, unless a pair or an ace and a face card can be played in front; If J to K, split into pairs, unless the hand also contains a pair of 10s or higher;If Aces, split into pairs, unless a pair of 4s or higher can be played in front. If there is Royal Flush always play from behind. If the Royal flush is two pair, split as per two pair rule. Split, if an A, K or a pair can be played in front and a straight or flush behind. In case of Five Aces; split, unless a pair of Ks can be played in front. The House Way is the set of instructions each casino gives its dealers on how to set their seven card hands. Most online casinos offer a House Way button so that you can automatically take advantage of this set of rules. What’s important here is to understand that the House Way isn’t set to win all the time, but to keep losses down so that the casino wins in the long term. In other words, the House Way is a safety option, probably best suited to new players and who want low-risk . Another important point is that some House Way buttons automatically play the hand once it’s set. Others set the hand but give you the option of whether to play it that way or not. This may not seem much but it affects your overall strategy. If you bet on the bonus, then you’ll win up to 8000 times your stake if your seven cards contain a bonus hand. The payouts are big, but don’t come anywhere near the odds against, so the house edge is substantial. This won’t suit low and medium risk players. However, if you’re a high-roller, and prepared to take the risk, the Bonus bet adds enormously to the fun and excitement of Pai Gow Poker. Online casinos provide strategy calculator to analyze the best strategy to use. You have to select 7 player cards. You can make the card selections by either clicking on the deck of small cards or by entering the cards manually using the text boxes. The text box entry is in the form 2D = 2 of diamonds, TS = ten of spades, KH = king of hearts, etc. Then click on a large card to clear and replace the selection for that card. The calculator will return the strategy decision that has the highest EV, assuming a 5% commission and generic dealer strategy. Though dealer strategy can vary according to different software. Thus choose while playing Pai Gow Games the best strategy to use when the dealer is banking; when you are banking and with every other hand.